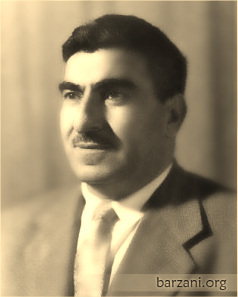 The most prominent Kurdish national leader, Mustafa Barzani, was President of the Kurdistan Democratic Party (KDP) when he died on 1 March 1979 at Georgetown Hospital, Washington DC. Millions of Kurds and others mourned him. His memory will remain alive in the hearts of all Kurds who support the aims he struggled for all his life. He will remain a towering figure in the history of the Kurdish people. He remains the inspiration and ideal for today's Kurdish youth who are fired by the spirit, tenacity and resilience of the legend that never wavered in his commitment to the Kurdish struggle for Peace, Freedom and Democracy. 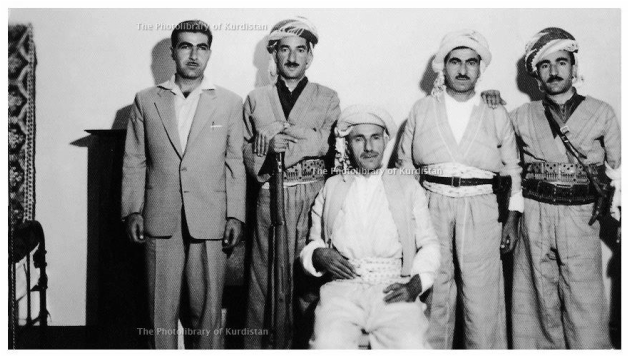 From left to right: Obaydullah Mustafa Barzani, Muhammed Khaled Ahmed Barzani, Sheikh Ahmed Barzani (sitting), Mustafa Barzani, Nazir Ahmed Barzani.